Zero waste air freshener is so easy to make. It will literally take you not even 5 minutes to whip up. Plus, it smells so nice. I personally love the smell of citrus - it boosts my energy and is powerful enough to override icky smells. That's why I decided to make this citrus room spray. This DIY air freshener will brighten any room, without causing a coughing or sneezing fit. Not sure about you, but every time I spray traditional air fresheners, I always feel the need to run out of the room really quick. It literally feels like I can't breath, and the air freshener bothers my nose or throat so bad. I wind up getting the sniffles or feeling irritated in the back of my throat, even if I don't spray a lot. Not cool. That's because traditional air fresheners are full of questionable ingredients. And they certainly aren't good for the environment, either. I'll stick to this zero waste air freshener, thank you very much. I don't feel like I have to hold my breath after spraying it, or like I immediately have to exit the room. Plus, it's much cheaper to make (like, seriously, your wallet will thank you). There's so much to love about it. Ready to make some for yourself? Note on spray bottle: I used a small glass spray bottle for this. It housed lavender toner in it previously, so I figured it would be nice to reuse it when it emptied. You can use any size spray bottle you like. It's okay if it's plastic - just use what you have to prevent it from going to landfill. Add the essential oils to the bottle first, then fill your bottle with water using a funnel. Make sure to screw the top back on the glass bottle and secure it tightly afterwards. Shake the bottle to mix the ingredients together. You'll want to shake it every time before use for best results. The solution can separate a bit between uses, but that's perfectly normal. Spray around the room as needed. I usually spray about 5 times for the best results. As far as actually using the citrus spray goes, it's pretty straight forward. This stuff works really well on freshening up a room. It's also pretty powerful. You don't need many sprays - it all depends on how sensitive you are to the smell. Just spray it in the area of your choice. I like to spritz it at least 5 times, but you can figure out a number that works for you. Anywhere really. Because the size of the glass spray bottle I chose is small, this makes it very portable. I can put it in my purse and bring it with me anywhere. This means if I wind up in someone else's bathroom, I can utilize it. Perfect for masking any unpleasant scents. 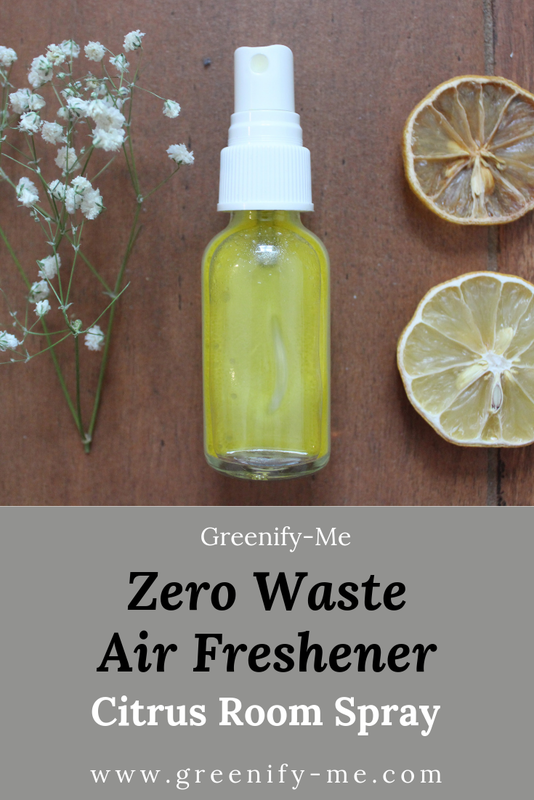 You can even spritz some of this zero waste air freshener in your wardrobe to freshen up your linens. Just make sure you don't overdo it and make them damp. Citrus is such a pleasing fragrance. Very invigorating. Sometimes I'll spray this just when I need a boost, or to lift my spirits. It doesn't always have to be to mask an odor. It also lingers for a decent amount of time, which is honestly great. I was worried it would disappear quickly, but adding the amount of essential oil I did helped make it extra potent. And guess what? It's never overpowering. Doesn't make me want to hold my breath and run out of the room, that's for sure. Storage: I'll just be leaving this on my desk or in the bathroom for all to use. Or, I'll be taking it with me in my purse. Doesn't really matter, because it's so versatile. Perhaps if I get another, bigger glass spray bottle, I'll make a batch specifically for my bathroom. I might want to label it, just so no one mistakes it for anything it's not. Perhaps I'll write 'zero waste air freshener' on it with permanent market, or something. Will you be giving this citrus room spray a shot? What's your favorite zero waste air freshener? Timely post and answer to a need I had. Recently I visited a friend and felt my throat was closing up. I realized the house had plug in air fresheners in every room, scented candles and bathroom air freshener. I politely ended my visit knowing we would meet elsewhere next time. I will try this recipe. I like using natural ingredients and of course only glass or when needed reused plastic containers. Another tip I have used it to put a few drops of essential oil on a lampshade or a cloth draped safely over a lamp to infuse a clean smell through a room. Thanks for this recipe!